The Groninger Museum is best known for the building’s design. Considered a post-modern masterpiece, or a post-modern monstrosity, depending on who you ask, each of the seemingly disconnected parts was designed by a different architect: Alessandro Mendini, Michele de Lucchi, Architectural bureau Coop Himmelb(l)au and Philippe Starck all had a hand in designing different “pavilions” of the museum. The disjointed parts make up an artificial island in a canal, and are linked internally by corridors. A pedestrian and bicycle bridge links the building to the banks of the canal, at the same time connecting the train and bus station on one side with downtown Groningen on the other. The result is certainly eye-catching. The museum’s permanent collection spans centuries, from archeological artifacts to postmodernist pieces. Its most notable collection contains expressionist paintings from the artists’ collective De Ploeg of the 1920s. Besides the architecture, though, what draws the crowds to this museum is the excellent special exhibitions it houses from time to time. Just before his death, for example, I attended a wonderful exhibition about David Bowie and his work. 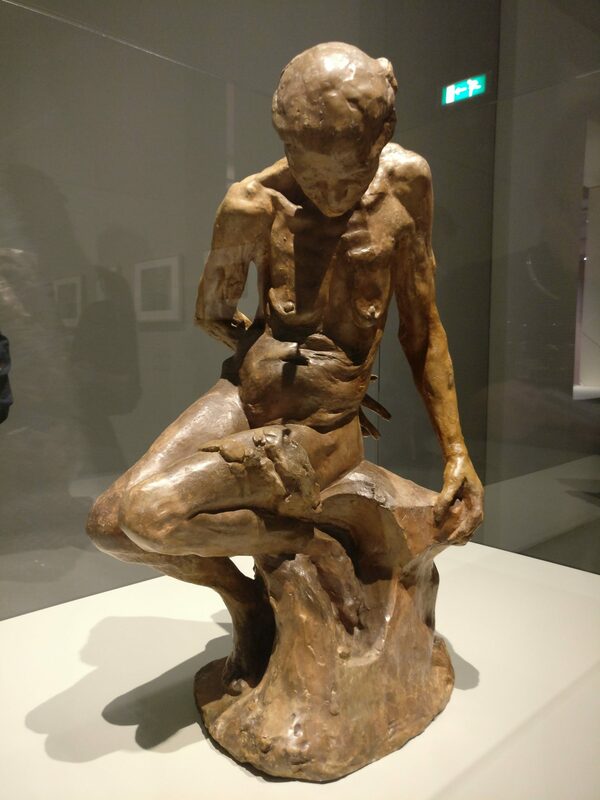 Lasting until April 30, 2017, the Groninger Museum’s current special exhibition is called Rodin: Genius at Work. It’s not huge, but it gives real insight into Rodin’s process and techniques. Through ten rooms and 180 works, the exhibits take visitors through a range of techniques and materials – assemblage, plaster, clay, photography, drawings, bronze and marble, and it groups some works by subject – The Gates of Hell, which was his first public commission and the inspiration for many works that followed; his live models; Honoré de Balzac; the Siren; and the Burghers of Calais. 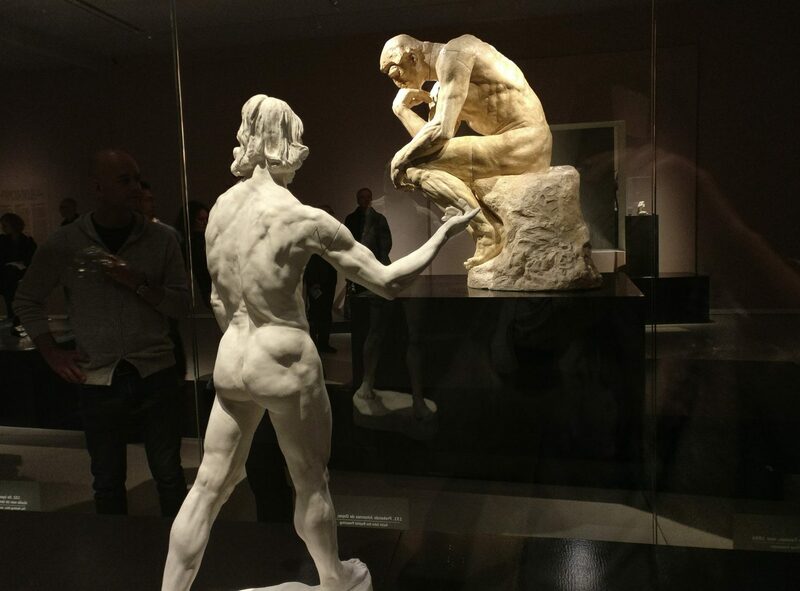 Two Rodin works: In the foreground, a small plaster cast of St. John the Baptist Preaching (1878). In the background, a large statue of The Thinker in patinated plaster from 1903. For me, the highlight was a full-scale version of The Thinker. Rodin originally designed it in a much smaller size, and intended it to top his The Gates of Hell doorway. It was meant to represent Dante Alighieri looking down over the circles of hell. As Rodin did with many parts of The Gates of Hell, it later became a separate sculpture in its own right. Some parts of this exhibition are fairly traditional: sculptures displayed in glass cases, either individually or in groups. Placing items of the same type or material together works well, though. The Age of Bronze by Rodin: 1876, but all cast in different years. 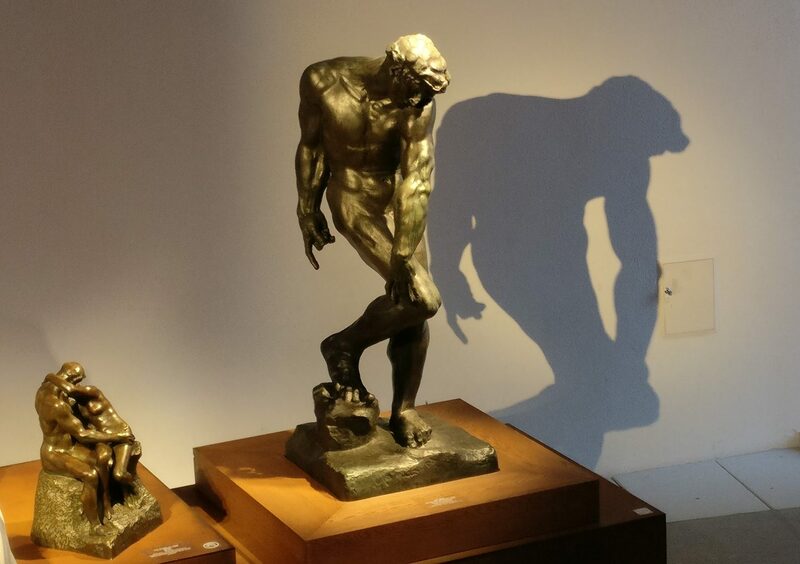 Often Rodin created multiple versions of the same work, and the bronze section illustrates this well. There, five versions of the same work, called The Age of Bronze, stand in a circle. A life-size figure of a man, each was cast in bronze in a different year, ranging from 1900 to 1920, and each was finished with a slightly different patina. We tend to think of art works as one of a kind: as definitive works. Yet these, all of which have spent the intervening decades in different places, end up looking quite different. The last rooms of the exhibition are upstairs in the Coop Himmelb(l)au-designed section of the museum: an open, irregular space, with lots of metal, few right angles, and surprising elements like a window in the floor. Here, Rodin’s famous The Kiss, in two different bronze casts, is displayed. Like The Thinker, Rodin designed The Kiss for The Gates of Hell, as an image of Paolo and Francesca, characters from Dante’s Divine Comedy. While the Rodin exhibition doesn’t evoke the strong emotional response of the Groninger Museum’s last bestseller, the David Bowie retrospective, I’d certainly recommend it if you’re interested in both product and process of a renowned artist. When we visited, we also did a quick tour of some of the other work on display. Erwin Olaf created a small collection of photographs on assignment from the museum to complement the Rodin show. Olaf photographed dancers from the National Ballet reenacting famous Rodin poses like The Thinker and The Kiss. I enjoyed the variety in an exhibition of Joost van den Toorn’s work. 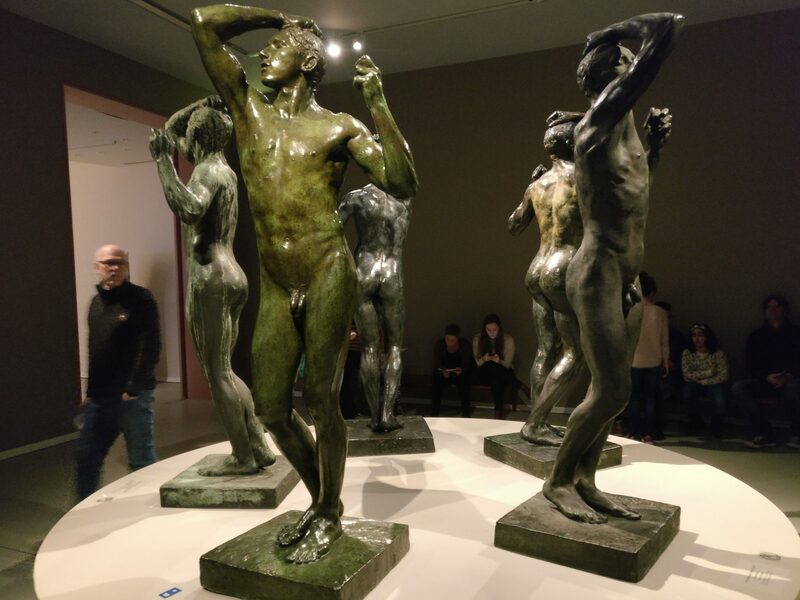 Ranging from rudely sexual to overtly political, and using a surprising variety of styles and materials, I found myself chuckling out loud at some of them, and insisting that the rest of my family, who had come to see the Rodin show, come and take a look at this one as well. 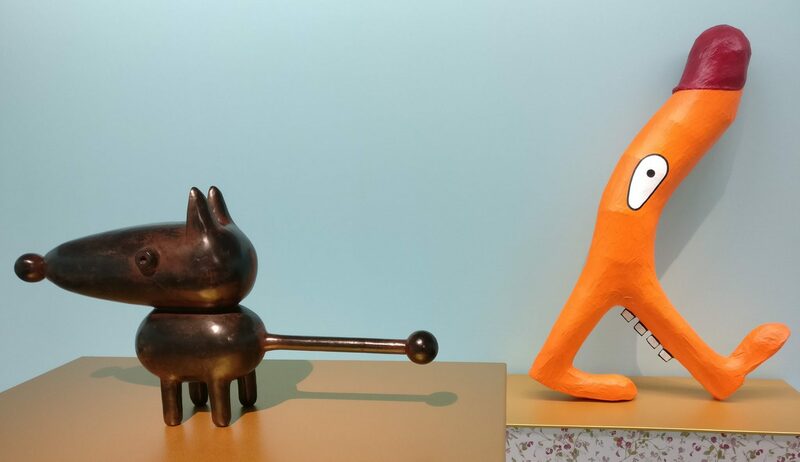 That’s the thing about the Groninger Museum: while the big, highly publicized shows like Rodin: Genius at Work are the events that get me to visit, I often discover surprising art, and surprisingly good art, along the way. Rodin: Genius at Work is open until April 30, 2017. 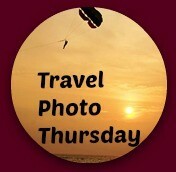 Adult tickets are €18.00. Was this the same exhibit as I saw? I mean, was it focused in the same way on his techniques and materials? I found it a really interesting way to approach the subject. The New York Times linked to your page thanks to your witty insight regarding the museum https://www.nytimes.com/2019/03/24/obituaries/alessandro-mendin-dead.html.